This was number 19 in my series of upcycled blues quilt tops. Sigh. I know. We're all getting tired of blues! And take heart - we are truly coming to a close now. As I write this post, of the finished tops, I only lack quilting 2 of them - you'll be seeing them in the new few weeks - but I've also started other things in the meantime. There is usually a lag time between what I've done and what I show you. Sometimes more - sometimes less. This one finished at 107"x107" so it is a king size quilt - and very elegant looking - at least as elegant as a scrappy quilt can look! This one uses up a tremendous number of scraps - and because of the white, it forms a cohesive unit. I'm a member of a Scrap Quilting group on Facebook. A while ago a lady named Barbara Biddlecome Harper had an old quilt she wanted to make - a very old one. 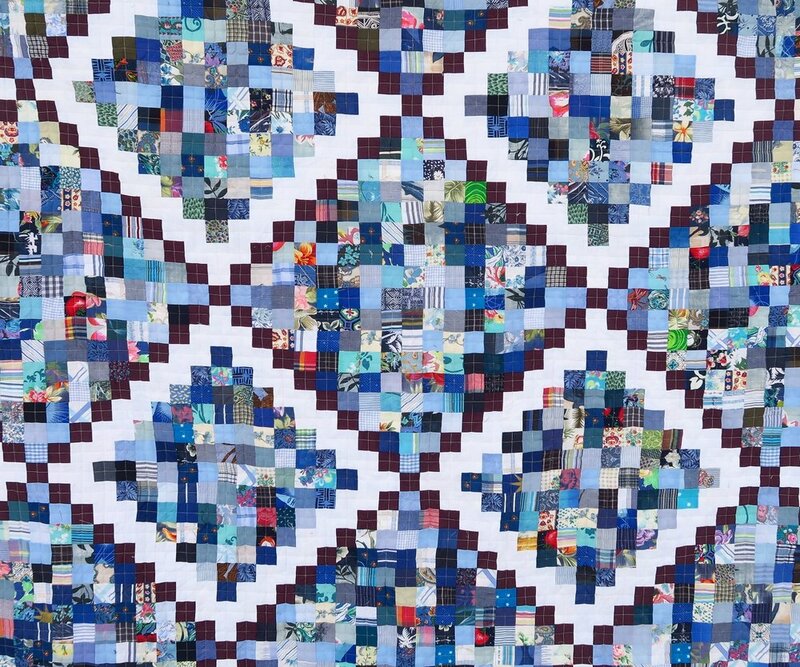 She knew it was a variant of an Irish Chain quilt but couldn't quite figure it out so she asked us if any of us knew what the pattern was - and no one could identify it at a glance, but we knew we could figure it out. And so we did. Together we worked on it and in the end, I drew it out for the group using the EQ program (Electric Quilt). I posted the blocks on the group and that was the end of that. I hadn't heard much about what was going with it as I have been extremely busy and haven't been visiting that scrap quilting group as much - focusing more on my own group (Quilted Twins - Scrap Quilting and More with Becky). Of course, once again, I used upcycleds on the back. Since this was number 19 in my series, my blues are seriously depleted - at least the blues I thought to use as backings. That's the reason this one got a purple/lavender themed back. Of course in the meantime, I had decided to use the pattern as part of my upcycled blues project....and finished the top a few weeks ago and talked about it on March 14 here on the blog. 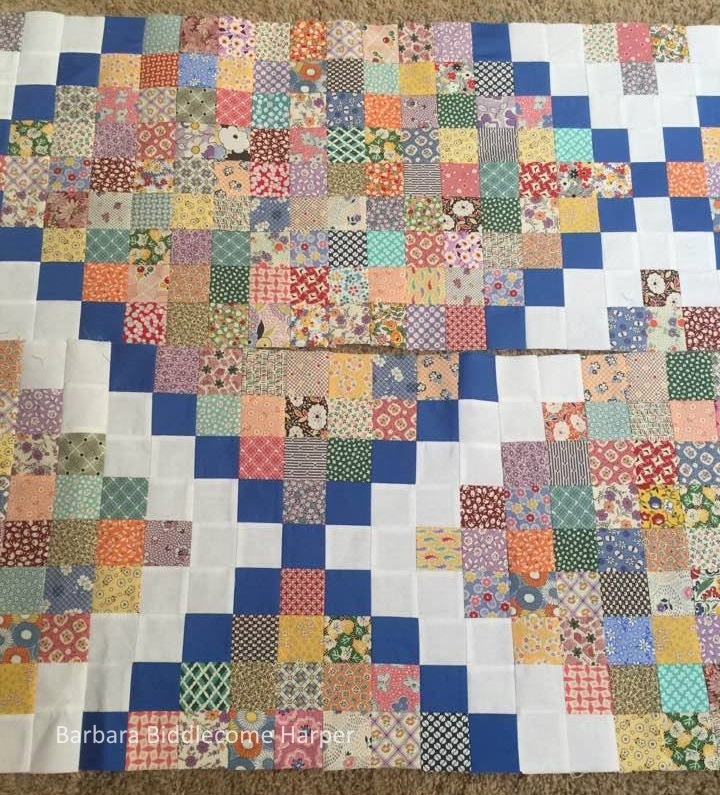 Then, I saw that Barbara had posted her top in a different quilting group - and I loved it! Really it was beautiful. And then, she was sweet enough to send me a message with a picture via Messenger to me, just to make sure I saw it! Of course, I loved it. I will be sharing her pictures and her work below. And the quilt roll - of course! I decided to quilt this one with a straight line quilting - so it took hours and hours. But it was easy to do. I just eyeballed the center of the blocks, used my walking foot, and went for it. I have one of those special metal attachment things that will, if you go slowly and carefully give you almost perfectly straight lines - as you follow the edge of a seam with it (that's the hard part!). Since I was willing to go right down the middle of the blocks, it was pretty easy. While I don't "hate" the quilting part anymore - in truth I never hated it - just struggled with it, after getting over my fear of it - it isn't the part I get the thrill out of. Yes...that's the piecing part - I really like the piecing - the magic happens for me when the design forms. The free pattern has been updated with new pictures. It's here! Here's an up close look at the prints she used. When I asked Barbara if I could feature her quilt along with mine, she was happy to share her pictures of her beautiful quilt top! She made the colorway I still want to do - more of a retro/thirties style! I love her colors! Barbara gave me a great shot of the fabrics she used - so we can see them up close and personal! Of course that magic happens when you start to put these blocks together! Here are her blocks in rows. I see she used 2" squares for the whites whereas I used 2"x3.5" strips - looks great! And here it is in all its glory! Isn't it just beautiful???? Makes me want to drop everything and get busy on my own version with these colors! Here is the same top only lying on the floor - This one is a real scrap buster..
You could certainly make it a planned quilt as well! Thank you again, Barbara, for sharing your top! At least from my vantage point, it certainly must be everything you had hoped it would be! And that's all from my part of the world for today. I trust you are having a great day, wherever you are reading this! Don't forget to check out what my sis has to offer over in the store!